Just like Bill, I too get a thrill from throwing open the bathroom door, turning on the light, waiting for it to flicker into life and the accompanying hum of the extractor fan and looking straight away for the complimentary shower gel and shampoo all neatly arranged as though in a chemistry laboratory next to the wash basin. Never mind the number of stars the place boasts on TripAdvisor or proudly displayed as a certificate at the reception desk for me this is the really true measure of a hotel. I can’t really accurately remember when these little gifts first started to appear in hotel bathrooms, certainly not on my early overseas adventures that’s for sure. On my very first holiday to Sorrento in Italy in 1976 I am absolutely certain there were none and there wasn’t a lot else either – no mini-bar of course and no television and it was light years before WiFi and Internet access. I think it may have had a small bar of soap! 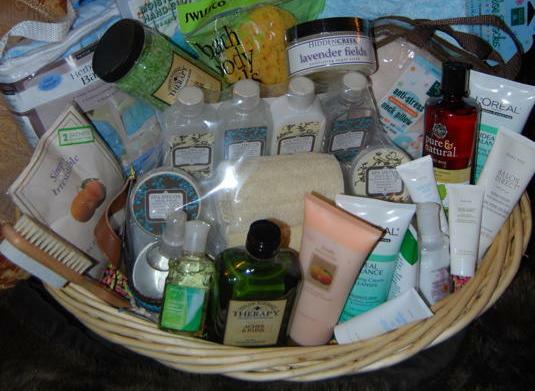 Guests were expected to provide their own toiletries in those days and without baggage weight restrictions holidaymakers used to lug an entire bathroom full of lotions and potions half way across the World and then take most them back home again! Thinking about it, I suppose they first came to my attention in 1995 when I was on a coach tour holiday of some of the National Parks in the USA and each motel bathroom that we stayed at had these little bottles of gooey bathroom goodies and every night I greedily collected them up and secreted them in my wash bag. Soon the bag was full and the zipper was straining fit to burst but at some point along the trip we stopped at a shopping mall where there was a ‘dollar shop’ and my brother, Richard and I found some nice little wicker baskets that were perfect for keeping them in and giving away as gifts for family and friends when we returned back home. The beauty of this of course was that none of my family and friends had ever come across complimentary give-away cosmetics before either so they all thought that they were getting a really genuine gift. I had never been to one of these out-of-town shopping malls before either and I remember thinking that they were really dreadful, sadly, we now have these soulless, pointless places all over the UK as well. Who started it I asked, well, claiming credit on its web site for introducing complimentary gels is the Canadian international luxury, five-star hotel chain, Four Seasons Hotels and Resorts but I am certain there will be some conflicting claims from elsewhere. 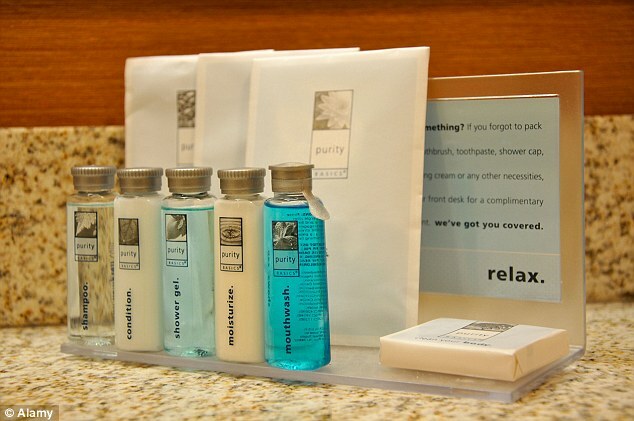 These days any self-respecting B&B or hotel has free shampoo in little plastic bottles. Except those that have large squeezy containers that are screwed to the wall so that you can’t take them away and for me this always loses the place a couple of points when I complete the post stay satisfaction survey. When staying in the room I always remain reluctant to use the giveaways because I view them as a sort of holiday bonus, a trophy and together with the sewing kits and the plastic combs, the pointless shoe horn and cheap toothbrushes I collect them up and take them home (except the plastic shower caps which always remind me of the rain bonnets that my mum used to wear and look completely ridiculous). I mean next time you are tempted to pull one over your head make sure that you lock the bathroom door and then just take a moment to take a look at yourself in the mirror. I guarantee that you will look ridiculous! I can’t explain why they excite me, they are not top-quality products after all, I’m sure that most of them are based on some sort of industrial soap that probably doesn’t have many scalp or skin improvement qualities anyway. Sometimes Kim gets carried away and will say something like “Oh look, there is Moulton-Brown products in the bathroom”, I know that it is really cheap washing-up liquid but I say nothing and tactfully keep this devastating information to myself. In fact I am almost certain that although they may be different coloured liquid in the bottles that they are all the same product anyway with a bit of food colouring added and the shampoo works just as well as bubble bath and vice versa. Back at home they sit in a box in the bathroom and every so often it overflows and the cabinet door won’t shut properly and it has to be cleared out and the little bottles disposed of – these days I take them to a homeless charity in the town and hope they come in useful somewhere. 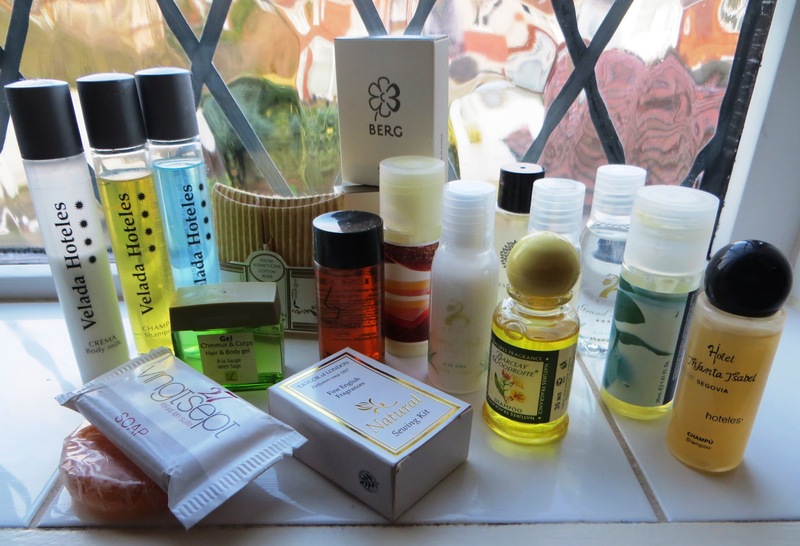 Apart from complimentary shampoo and shower gel what else do you own up to when taking things from a hotel room? 1 The tea bags and the coffee sachets? 4 The Bottle Opener in the Mini-Bar? 5 The Gideon Society Bible? 6 The Notepaper and Pencil? 8 The pictures on the Wall? I can’t really accurately remember when these little gifts first started to appear in hotel bathrooms, certainly not on my early overseas adventures that’s for sure. On my very first holiday to Sorrento in Italy in 1976 I am absolutely certain there were none and there wasn’t a lot else either – no mini-bar of course and no television and it was light years before WiFi and Internet access. Guests were expected to provide their own toiletries in those days and without baggage weight restrictions holidaymakers used to lug an entire bathroom full of lotions and potions half way across the World and then take them back home again! Thinking about it, I suppose they first came to my attention in 1995 when I was on a coach tour holiday of some of the National Parks in the USA and each motel bathroom that we stayed at had these little bottles of gooey bathroom goodies and every night I collected them up and secreted them in my wash bag. Soon the wash bag was full and the zipper was straining fit to burst but at some point along the trip we stopped at a shopping mall where there was a ‘dollar shop’ and my brother, Richard and I found some nice little wicker baskets that were perfect for keeping them in and giving away as gifts for family and friends when we returned back home. The beauty of this was that none of my family and friends had ever come across complimentary give-away cosmetics before either so they all thought that they were getting a really genuine gift. I had never been to one of these out-of-town shopping malls before and I remember thinking that is was really dreadful, sadly, we now have these soulless, pointless places all over the UK. These days any self-respecting B&B or hotel has free shampoo in little plastic bottles except those that have large squeezy containers that are screwed to the wall so that you can’t take them away and for me this always loses the place a couple of points when I complete the post stay satisfaction survey. When staying in the room I always remain reluctant to use the giveaways because I view them as a sort of holiday bonus, a trophy and together with the sewing kits and the plastic combs and cheap toothbrushes I collect them up and take them home (except the plastic shower caps which always remind me of the rain bonnets that my mum used to wear and look completely ridiculous). I mean next time you are tempted to pull one over your head make sure that you lock the bathroom door and then just take a moment to take a look at yourself in the mirror. I guarantee that you will look ridiculous! I can’t explain why they excite me, they are not top-quality products after all, I’m sure that most of them are based on some sort of industrial soap that probably doesn’t have many scalp or skin improvement qualities anyway. Sometimes Kim gets carried away and will say something like “Oh look, there is Moulton-Brown products in the bathroom”, I know that it is cheap washing-up liquid but I say nothing and tactfully keep this information to myself. In fact I am almost certain that although they may be different coloured liquid in the bottles that they are all the same product anyway and the shampoo works just as well as bubble bath and vice versa. 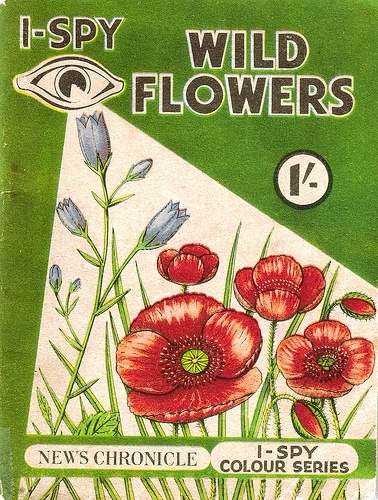 I-Spy books were small paperback books that were popular in the 1950s and 1960s. Each book covered a subject such as I-SPY Cars, I-SPY on the Pavement, I-SPY on a Train Journey, and so on and so on and so on. The object was to be vigilant and spot objects such as animals, trees, policemen, fire engines, sea shells etc. etc. a bit like train spotting and they were recorded in the relevant book, and the more things you spotted this gained points. More points were available for the more difficult spots. Once you had spotted everything and the book was complete, it could be sent to Big Chief I-SPY for a feather and order of merit. No, I kid you not! 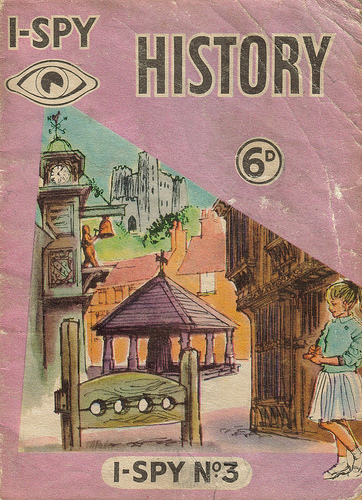 The books and the challenges were supposedly written by a Red Indian chief called Big Chief I-Spy who turned out to be a man called Charles Warrell who was a former school teacher and headmaster who came up with the idea of I-Spy in 1948. He retired in 1956, but lived on until 26th November 1995 when he died at the age of 106. For part of this time he also worked as an antiques dealer in Islington. Those who played the I-Spy game became members of the I-Spy Tribe and were called Redskins. The head office was variously known as the Wigwam by the Water or the Wigwam-by-the-Green. Neither of these exotic sounding places were situated on the American Plains or in the Black Hills of Dakota, the former was located next to the Mermaid Theatre at Blackfriars and the latter was in London’s Edgware Road. 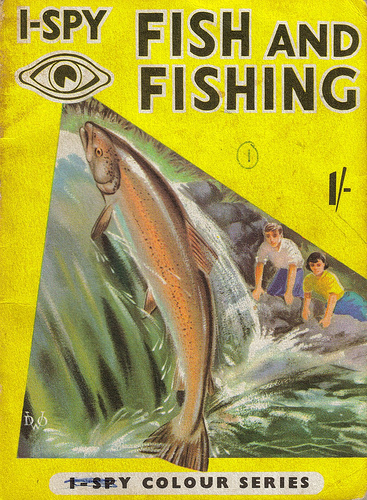 I had quite a collection of I-Spy books but to be honest I never finished any of them because some of the items were absurdly difficult to track down (how, for example, do you I-Spy fish unless you are a deep-sea fisherman working on a trawler or a scuba diver?) and I never got a single feather although I did join the club and had an I-Spy badge that I used to wear on the lapel of my school blazer. Some of these books were extremely useful for parents, especially on long journeys. For a very small cash investment there would be short periods of peace while children were preoccupied with spotting things – ‘On a Train Journey’, ‘Road Transport’ and ‘Cars’ were good for this sort of thing. 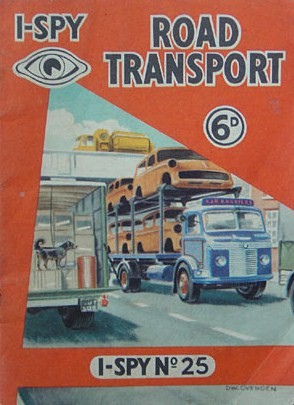 On a long car journey my dad would invent his own I-spy games and challenge us to spot a red lorry, spot a black cow, spot a petrol station, in fact spot pretty much anything he could think of if it successfully kept us all quiet. When he got desperate he would tell us to look out for the sea and when we were on the way to Cornwall or Wales he usually started this little distraction roughly at about Oxford which is of course just about as far from the coast as you can possibly get! This was very optimistic because if you are familiar with the geography of England this is the equivalent of trying to spot the Caribbean Sea from Kansas City, the Hudson Bay from Calgary or the Pacific Ocean from Alice Springs. 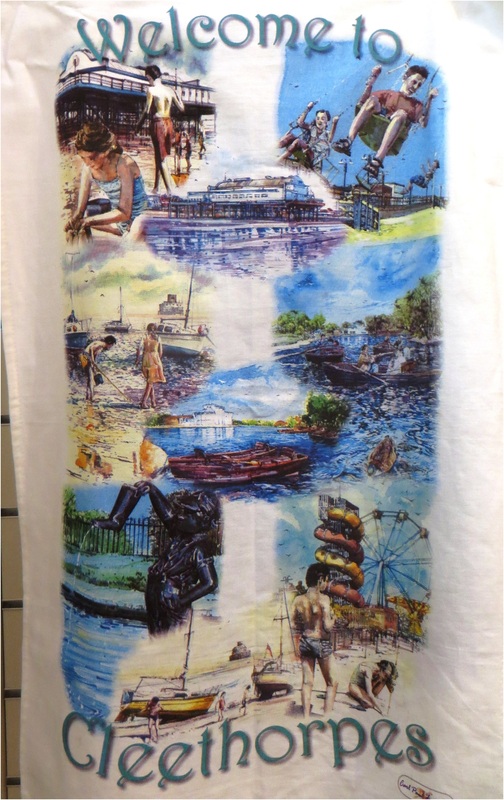 When you finally got there, ‘At the Seaside’ was very useful for parents because they could send you off for hours at a time staring into rock pools and poking around at the shoreline to find things while they sat and enjoyed the sunshine. I suppose some would be frowned upon today because they encouraged kids to go off to places that parents today would consider dangerous such as ‘In the Street’, ‘Boats and Waterways’, ‘Bridges’ and especially, probably the most dangerous of all, ‘Wild Fruits and Funghi’! Some were useless of course and we didn’t buy them, I mean what chance was there of completing ‘The Army’ I-Spy book unless your dad was a squaddie? And how were most normal kids supposed to spot ‘Aircraft’? I never went near an airport until I was twenty-two and neither did most of my pals. What sad games do you remember playing as children? How did you keep kids amused on long car journeys? I too get a thrill from throwing open the bathroom door, turning on the light, waiting for the hum of the extractor fan and looking straight away for the complimentary shower gel and shampoo all neatly arranged next to the wash basin. Never mind the number of stars the place boasts on TripAdvisor or displayed as a certificate at the reception desk for me this is the really true measure of a hotel. Guests were expected to provide their own toiletries in those days and without baggage weight restrictions holidaymakers used to lug an entire bathroom full of lotions and potions half way across the World. Thinking about it, I suppose they first came to my attention in 1995 when I was on a coach tour holiday of some of the National Parks in the USA and each motel room bathroom that we stayed at had these little bottles of bathroom goodies and every night I collected them up and secreted them in my wash bag. Soon the wash bag was full to busting but at some point along the trip we stopped at a shopping mall where there was a ‘dollar shop’ and my brother, Richard and I found some nice little wicker baskets that were perfect for keeping them in and giving away as gifts for family and friends when we got back home. The beauty of this was that none of my family and friends had ever come across complimentary give-away cosmetics before either so they all thought that they were getting a genuine gift. When staying in the room I always remain reluctant to use them because I view them as a sort of holiday bonus, a trophy and together with the sewing kits and the plastic combs and cheap toothbrushes I collect them up and take them home (except the plastic shower caps which always remind me of the rain bonnets that my mum used to wear and look completely ridiculous). I mean next time you are tempted to pull one over your head make sure that you lock the bathroom door and then just take a moment to take a look at yourself in the mirror. I guarantee that you will look ridiculous! I can’t explain why they excite me, they are not top-quality products after all, I’m sure that most of them are based on some sort of industrial soap that probably doesn’t have many scalp or skin improvement qualities anyway. Sometimes Kim gets carried away and will say something like “Oh look, there is Moulton-Brown products in the bathroom”, I know that it is cheap washing-up liquid but I tactfully keep this information to myself. In fact I am almost certain that although they may be different coloured liquid in the bottles that they are all the same product anyway and the shampoo works just as well as as bubble bath and vice versa.